Sixteen years after the release of Rocky V, Stallone climbs back into the ring for the final installment (one hopes) in the ultimate underdog series. After humble beginnings in 1976, Rocky has travelled the world, represented his nation in the Cold War, and now finally is back where it all began. To say that the Rocky series has had high- and lowpoints is an understatement, but this latest returns Rocky to his roots, and regains a lot of lost credibility. Not for Rocky the riches and lifestyle of modern sportstars – running a small restaurant (with the only attraction being a chat with the slurring former fighter), and sitting at the grave of his now deceased wife Adrian, is a far cry from the life lead by his eventual opponent, Mason “The Line” Dixon. Dixon’s hefty endorsement package and life of bling are at direct odds with Rocky’s sparse world. For this to be a Rocky film, however, there has to be a sentimental message, and in this case, Rocky has some work to do on himself. With ongoing grief over the loss of Adrian, and frustration at the breakdown in his relationship with his son, Rocky finds he has still got some boxing within. Anyone who has seen the trailer – or any other Rocky film for that matter – will know where this is going to end, and the true measure of the success of this Rocky film is that a more cynical modern audience will still be prepared to accept the overly sentimental speeches and emotionally manipulative ‘big moments’ on the path to Rocky’s resolution. This is no small achievement, as there are several sequences – particularly those dealing with Rocky and his son Rocky Jr. – that are about as subtle as the use of ‘Gonna Fly Now (Theme From Rocky)’ throughout the soundtrack to guide our appreciation. Stallone is excellent as Rocky, bringing a subtle take on the character that is removed from pomp and allows the story of the ageing fighter to hit home. His frustrations and loneliness are demonstrated effectively, and his portrayal of the underdog is another reason the audience will be cheering him (just as the thousands in the crowd are) by the end. Burt Young reprises Paulie, and although he does have several hurdles of his own to cross, these seem incidental and are left somewhat unresolved in what is a significant miscalculation. Milo Ventimiglia’s Rocky Jr. seems to come around to adoring son far too easily, and Geraldine Hughes as Little Marie does her best in a limited role that perhaps doesn’t fill the hole left by Adrian. The pacing and balance of the film are also problematic, with the early sections mostly character data that is important to bringing the audience around to supporting the ageing hero again, but which seem to swamp the training and fight sequences later in the film. The necessary inclusion of Rocky’s physical rebuilding echoes that of the original but isn’t nearly as inspiring, but the boxing scenes are effective. 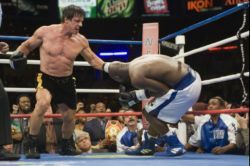 Audiences are likely to be moved as Rocky ‘The Italian Stallion’ Balboa fights one last time, in spite of the many flaws of the film. Unbalanced, overly manipulative in its use of soundtrack and scripting, and featuring a range of half-drawn characters, Rocky Balboa is still enjoyable, and a fitting end to the series.